Hey Everyone! So if you read my New Year's Resolution's blog post then you will know that one of the things I want to do more of this year is travel. Now that I work for BA I'm lucky enough to get the opportunity to be able to travel the world a lot more than I would normally do. I'm super grateful and excited for this opportunity and I'm just excited to get out of the UK a lot more now as I am almost 25 years old and there are so many places I want to visit. 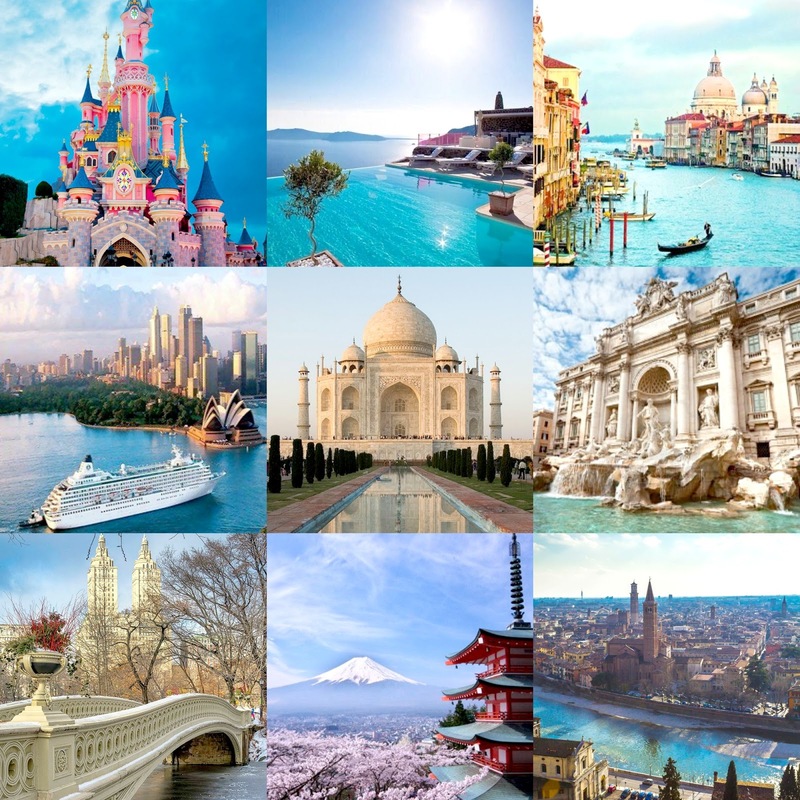 Here are the 9 places I want to visit more this year. Now I have been to France around 13 times throughout my life with family during my childhood. However, throughout that time we never ever visited Paris and it has been literally my dream to go there since I was about 5 years old. I've never been to Disneyland which is a crime because if you know me you'll know how much I love Disney! If you follow me on twitter then you would have seen me say earlier that I'm thinking this year to go there for my birthday. Yes, I will be 24 years old but hey, you're never too old for Disney! So many youtubers have been there recently too and all their vlogs have just made me want to go even more! Greece is another place I have always wanted to go. It's just so beautiful, however I have been reading a lot about Mykynos and it's just such a beautiful place. It's a place that a lot of bloggers go too and after seeing all their posts and photos of it I've definitely added it to my wishlist this year as it's just so incredibly beautiful. I'm looking forward to going later on this year in the Summer hopefully. Venice is a place in the world that sadly won't be there for that much longer. It's slowly sinking due to the rising water levels and it saddens me greatly. It's just such a stunning place and everyone I know who's been there has had nothing bad to say about it. I just really hope someday soon I can visit this beautiful place. Sydney is one of those places that means a lot to me and is one of those places I know I have to visit. My Dad lived there for four years when it was in his late 20s, early 30s. I have two step-brothers there who I have never met but who I am desperate to meet and a lot of my favorite TV shows growing up were filmed around Sydney and in Australia in general. I am also obsessed with the Australian accent. It's just a place I know I have to spend some part of my life in. One of the 'new' seven wonders of the world. The Taj Mahal is somewhere that I have been so fond of visiting from a very young age. I have always been fascinated by India and the Indian Culture. My mum is from Mauritius which isn't near India but the way they live and cook and traditions are very similar. I have grown up watching Bollywood films and listening to bollywood music, going to Indian weddings and I have loved it. The Taj Mahal was always mentioned a lot to me growing up. My cousin who lives in Mauritius recently visited it and she absolutely loved it so I'm hoping to follow along in her footsteps and visit it as I absolutely love the building. It's so beautiful. Another beautiful place in Italy. I just want to visit Rome so badly as I love the accent and the music as well. I especially want to visit the Trevi Fountain as I just find this fountain so beautiful. I think everything about it from the architecture, to throwing a coin in and making a wish is just so stunning. It also reminds me of the Lizzie Mcguire movie and yes I know the chances of me finding out I'm a doppleganger for a famous celebrity in Italy is very slim (watch the film if you don't understand that reference) but that's really what introduced me to this part of the world. I'd also love to be able to go and visit the Vatican City as well. Now if you follow me on twitter or know me in real life then you will know how desperate I am to go to New York. I just absolutely love everything about it. I'm a city girl at heart so any city in the world is somewhere I know I must visit but New York or the 'Big Apple' as some may call it is definitely number one on my list and always has been. Central Park is massive and I just would love to take a nice stroll through it, I know we have Hyde Park here in London but it's just not the same and I'd love to see if it's like what you see in movies. I just have to visit New York. It's not even a case of wanting to anymore. I HAVE GOT to go! In the past couple of years I have become really interested in Japan, China and other Asian places around the world. However, Mount Fiji has ALWAYS been a place I have wanted to visit. I just think it's so amazing and I would love to climb it. I just think it's one of the most beautiful mountains in the world and I'd love to see it up close. I've just realised that there has been a lot of Italy in this post! Verona was never really a place that stuck out at me as a place to visit until I watched the film 'Letters To Juliet'. The way they shot the film was so beautiful and they really captured how stunning Verona is! I would love to visit Juliet's House and Lake Garda and all these places you hear about but sound like a complete dream. I just really hope one day I can go here. If you haven't seen 'Letters To Juliet' watch it and then you'll see why I fell in love with the place! So there we have it. All the places I want to visit in 2016. Originally when I wanted to write this post I wanted to put Mauritius on the list but I'm actually going to Mauritius on the 23rd of this month and I am ridiculously excited. My family on my Mum's side live there and I am looking forward to seeing all my cousins and everyone too. I can't wait to go on holiday! I'll have a few packing tips and travel themed posts coming up so make sure to stay tuned for them! I hope you enjoyed this post and if you've been to any of these places before be sure to let me know what you thought in the comments below. What places are on your 2016 travel wishlist? Thanks for sharing, and I hope you get to go to all of these wonderful places! Argh Julia beat me too it ... ever since I went to Rome - all I can tell people is (if they are talking about holidays) is GO TO ROME! haha! It really is beautiful, amazing and lovely. We went in April and it was still so warm. There is so much to see and do. We ended up walking about 12 miles a day and were so tired each day but so worth it. Disneyland Paris is just the best! Trust me if you can go at Christmas Time as well it would be even 1000 times better, and it isn't even that expensive if you go the 1st week of December its very quiet and cost me and my partner £793 for hotel, flights, park tickets and transfers (breakfast included) for 4 nights and 5 days. Yet if you go in September its £300 more :/ doesn't make sense really!